Wader Quest: Silent Shorebird Crisis: A message from Birdlife Australia. Silent Shorebird Crisis: A message from Birdlife Australia. Recently we received a communication from Birdlife Australia reiterating exactly what we have been saying since we started Wader Quest and that is that wader conservation and the crisis facing waders or shorebirds is under-appreciated and under-recognised; what BirdLife Australia refer to as the Silent Shorebird Crisis. ... although the threats to waders had never been greater, awareness of those threats, even among birders, was not growing in proportion, in short, the crisis was unfolding almost unnoticed. Whilst it is relatively easy to get people emotionally engaged when seeing magnificent, centuries-old trees being felled and huge tracts of forest turned to a smouldering pile, it is much harder to get people fired up by what is essentially mud. Mud: A habitat only a mother could love, and yet it is essential to the very existance of millions of living organisms, a large proportion of which are waders. Whilst the comments made by Birdlife Australia relate to that country, the same can be said of wader populations worldwide. 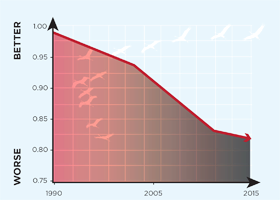 The red line in the graph below shows the huge decline in Australian wader numbers overall. Mongolian Plover (Lesser Sandplover) numbers in Australia have fallen 84% across 49 sites in the last 24 years! Both Eastern Curlew and Curlew Sandpiper have suffered losses of over 80% in Australia too placing both species on a national list of Critically Endangered birds. Eastern Curlew Numenius madagascariensis: Cairns, QLD, Australia. The Mongolian Plover, Greater Sandplover, Great Knot, Red Knot and two subspecies of Bar-tailed Godwit have also been nominated as potentially joining this list. Bar-tailed Godwit Limosa lapponica baueri: Foxton, Waikato, New Zealand. Birdlife Australia also underline another of our major concerns, the piecemeal small, local, losses of habitat, a 'death by a thousand cuts' each of which is considered insignificant, but the cumulative effect is disastrous. It is not safe to assume that displaced birds will find suitable habitat elsewhere. Much of these population declines can be linked directly to the disaster that is befalling the Yellow Sea region where reclamation has resulted in 40% (and rising) loss of the tidal flats that waders use to rest and feed. The Great Wall of China has nothing on the great sea wall of China which holds back the sea and behind which the stranded beach gets filled and built upon. 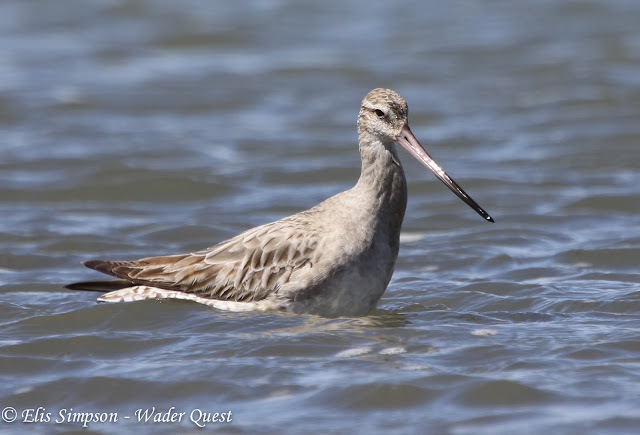 Wader Quest has donated AU$200.00 to the Silent Shorebirds Crisis Fund. It is indeed a sad situation when we know that the animals do not have a guaranteed new habitat but there isn’t much we can do from a small scale. It is all part and parcel of life cycle and we as human can only appreciate nature whilst it is still there. After my shift at the self storage nearby, I would visit the beach to catch final glimpses of these species for memories sake. Thanks for your comment Cameron. There are a number of community based conservation projects around which do actually address local problems on a small scale. If there is one near you you could always volunteer for that or, if not, there may be a chance to start one if the local habitat needs protection or just monitoring. Cheers.